A world without nuclear weapons? I would definitely go for that – and have been doing so for at least 60 years! But, let’s be positive – a world WITH what? Stores of conventional weapons at least enough to commit Guernicas, Coventrys or Dresdens over and over again? Surely not – even though it’s what I thought for a few years after understanding I would be happy to see nukes done away with. Let’s forget for a moment all that dreadful hardware and consider ourselves and our feelings and needs. We are hearing a little more talk – if rather vague and ill-defined – of the importance of Values – Universal Human Values. I don’t mean those values confined, constrained and even twisted by qualifying adjectives such as “British” or by some group or other wanting to make their point. The media is full of talk about what may be called “Anti-values” like hate, anger, intolerance and disrespect. We also learn that these should be condemned or challenged by the taking of revenge. But that only takes us back to all those weapons. Let’s try to break the cycle of violence and take a deeper look at just one of those Universal Human Values – and there could be close to a hundred of them that I’ve identified. “Values-based Education” gets young people to learn about 22 of them as teachers integrate them into the whole curriculum. How about the Value of “Tolerance”? For me, being tolerant is accepting differences with good grace – in the way others may think, look, speak or act. Being tolerant is being free of prejudice while knowing that all people have feelings, needs, hopes and dreams. Tolerance is the accepting of things you may wish are different with patience and flexibility; tolerance means building unity with others who are different in some ways. How do you view this Value? What is the UK’s biggest political issue? A recent YouGov survey found that most people are concerned by either Brexit or the economy. Just 23% of people found defence and security to be the most important issues in Britain. So why does the UK government behave as if everyone in the UK believes the rest of the world is out to get us? The UK government is obsessed with spending on defence and nuclear weapons. Theresa May recently announced an unexpected increase in funds for the Ministry of Defence. £600m has been found to build a new class of nuclear submarines, at a time when the NHS is in crisis and more than 300,000 people are homeless in the UK. The total cost of replacing the Trident nuclear submarines is around £205bn. Imagine what this money could do for our health service, schools and housing. How can defence – especially of the nuclear variety – be considered a greater priority than the wellbeing of this country’s people? How many of the most common concerns could be solved by nuclear weapons? Interviews by ComRes in 2014 found that 47% of respondents aged 18-34 believed that nuclear weapons fail to protect the UK from modern day threats. Can a nuclear weapon feed anyone? Can a nuclear weapon stop a terrorist? What can a nuclear weapon do, apart from cause untold harm and severely escalate tensions between countries? Even if you consider nuclear weapons a solution for UK defence, we are no longer living in the Cold War. As proven by recent revelations, enemies are able to infiltrate democracies in far more insidious ways than simply dropping a bomb. In February, 13 Russians were charged with interfering in the 2016 American election, mainly using the Internet. Both Russia and the United States possess nuclear weapons. These weapons did not act as a deterrent for these Russians, nor could have prevented such an attack. The ComRes interviews found that most young people consider terrorism a problem for the modern world. The current threat level for international terrorism in the UK is severe. As with attacks on democracy, terrorism can’t be stopped with nuclear weapons. The idea of two countries facing off like in the Cold War now seems old-fashioned. Thousands, if not millions, of lives can be devastated with a single press of the nuclear button. 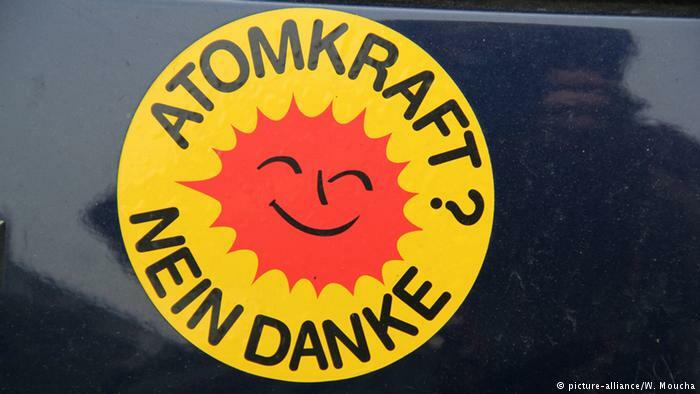 In the mid-20th century, countries saw nuclear developments as a symbol of their national progress. Now, possessing such weapons can make a country seem paranoid and bloodthirsty. Nuclear weapons can make the whole world worse off – spending the billions of pounds reserved for their development on other issues could make it a better place. Donald Trump is the peace movement’s greatest enemy, but he could become its greatest asset. 20th January 2018 marked a year since Donald J. Trump was inaugurated as President of the United States. Whilst he is deplorable in pretty much every category, Trump’s warmongering is one of his most shocking and dangerous qualities. According to MSNBC, President Trump once asked his advisors about using nuclear weapons three times in a single foreign policy meeting. It is difficult to watch a foreign country experience tax relief for the rich and fatal blows to their healthcare system, but it is quite another for the president of such a country to possibly endanger everyone in the entire world. The embodiment of American imperialism and interventionism, Donald Trump may be the death of us all – or our saving grace. You may be thinking – or hoping – that Donald Trump is simply America’s problem. Even with the former reality television star in charge, the United States remains one of the most powerful countries in the world. The U.S. Military budget for 2018 is US$824.6billion and the American nuclear arsenal is the second largest in the world. These facts, coupled with the Republicans’ unchecked political power, make the United States a credible threat to any country they so please. With Donald Trump’s tendency towards irrational rage, who knows which country may anger him next? As Trump himself once said: “good people don’t go into government.” Judging by his record so far, he’s right. Since becoming President, Trump has maintained a feud with North Korean leader Kim Jong-un, causing an unprecedented rise in tensions between the two countries. 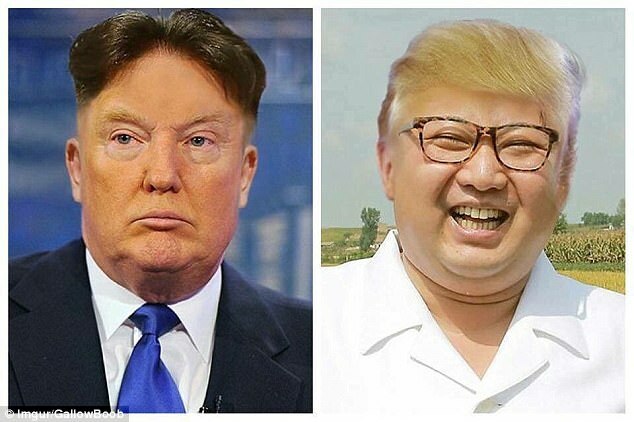 A spokesman for North Korea’s Foreign Ministry said what we were all thinking: Trump is a “nuclear demon” and a “disruptor of global peace.” Describing the supreme leader as “short and fat” shows that Trump is willing to take a gamble with all of our lives. Amidst their feud with the United States government, North Korea is in the process of testing nuclear weapons. Whilst I am hardly an expert on foreign policy, even I know that it is a terrible idea to personally attack the leader of the only country in the world that currently refuses to adhere to norms in nuclear weapons testing and proliferation. Trump is capable of causing untold destruction, and it’s not clear if he even knows this. take the aggressive route. Not only has he ignored a potential diplomatic solution, he has now taken to aggravating the situation, calling the North Korean Supreme Leader ‘rocket man’ whenever the opportunity presents itself. In typical Trump fashion, the President is more concerned with high-risk ‘negotiation’ strategies than the safety of his citizens and the wider world. North Korea is not the only victim of Trump’s alleged business acumen. The Joint Comprehensive Plan of Action (JCPOA) was a 2015 agreement that the U.S. signed with five other countries, banning Iran from developing nuclear weapons in return for lifting sanctions. The JCPOA worked well until October last year, when Trump decertified it, declaring it “one of the worst deals” he’d ever seen. Whilst this did not put an end to the deal entirely, it certainly strained the American relationship with the co-signers. In a rare joint statement, signatories (Britain, France and Germany) condemned this decision and said it was not in their “shared national security interest.” Not satisfied with angering potential adversary states, Trump is willing to make enemies of the countries that should be America’s closest allies. But how does all of this affect us non-Americans? It is the nuclear aspect of Trump’s warmongering that is particularly worrying. Consider the devastating effects of Hiroshima in 1945: a typical modern weapon is 8 to 80 times larger than ‘Little Boy.’ According to Dr. Philip Webber, the Chair of Scientists for Global Responsibility UK, a study of two countries of comparable size to the United States and North Korea, using up to 100 warheads, indicted that this could be catastrophic for the victims. Dr. Webber theorised that such an attack would cause “severe frosts, reduced growing seasons, drought and famine lasting up to ten years.” The attacked country would become “preindustrial.” Even if your country is lucky enough not to be targeted, you are not safe. According to the Atomic Archive, nitric oxides produced by nuclear weapons could reduce the ozone layer in the Northern Hemisphere by 30-70%. This could potentially cause dangerous burns and other untold ecological changes. Our world as we know it could change – all because one man in America picked fights and scorned deals. Having read this article thus far, I wouldn’t blame you if you are feeling fairly panicked about the Trump presidency. Fear not. Whilst the US President’s actions have far-reaching, potentially devastating consequences, they could also have far-reaching, potentially beneficial ones. Because he causes so much outrage across political lines, languages and continents, Donald Trump is actually an asset to the peace movement. He is so controversial and detestable that even the most apolitical among us have been inspired to protest against him. whilst Theresa May was caught holding hands with the President, Angela Merkel was shunned when she went to shake his hand. If your country’s leader supports Trump, condemn them for this; if they don’t, show your support. In the United Kingdom in particular, re-evaluating the ‘special relationship’ is crucial. In light of the conflicts in Iraq and Afghanistan, it is likely that the UK will be dragged into any international conflicts that Trump starts. Interestingly, it appears that opinions on British involvement on the world stage are changing. In 2017, Young Labour delegates voted in favour of a motion that called Trump a “fascist” and proposed that the UK withdraw from NATO. The motion stated that “NATO has been the lynchpin and institutional expression of American imperialism.” Through involvement in organisations like the Campaign for Nuclear Disarmament (CND), Britons can show our government how we feel about the “fascist” President. At the time of writing, a Facebook event for a Trump protest in London has 96,000 people interested. Donald Trump is said to have cancelled his proposed February visit because of his fear of a backlash. If we continue to protest and support anti-Trump organisations, what else can we pressure him into? Many of us exist in a bubble. As our lives are not directly threatened by nuclear weapons every day, some of us develop the view that they are necessary, harmless, or even stand to protect us in some way. Many people who support nuclear weapons believe that they are preparation for a worst-case doomsday scenario. I would argue that, with Donald Trump in charge of the world’s second largest nuclear arsenal, we are living in this worst-case scenario. 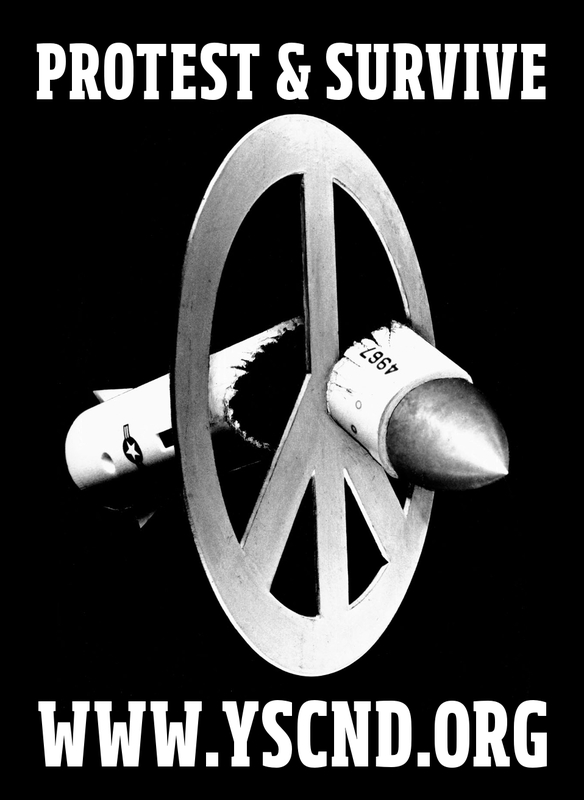 Ironically, nuclear disarmament would make us all safer. he Trident programme, and Kim Jong-un testing both a successful hydrogen bomb and an ICBM, it can be difficult to see the positives. However, there is much to be hopeful for. The most striking development, a product of the combined efforts of hundreds of nuclear campaigning institutions, is the United Nations’ Treaty on the Prohibition of Nuclear Weapons. The UN treaty is the first international treaty to explicitly prohibit the development of nuclear weapons. Voted in by nearly two-thirds of all UN member states (122), and signed so far by 53 of them, it offers a major challenge to the global acceptance of nuclear weapons. While it has not yet been recognised by the nine nuclear-armed states, the treaty presents an unambiguous condemnation of the continued existence of nuclear weapons – something that the 1968 Non-Proliferation Treaty failed to do. The global nuclear ban therefore offers a different kind of progress – normative progress. The great success of the nuclear ban brought about another accomplishment – the awarding of the Nobel Peace Prize to the International Campaign to Abolish Nuclear Weapons (ICAN). As with the treaty itself, ICAN’s achievement might be imagined by some to have little influence on the overall disarmament process. Yet the award, as with the ban, demonstrates a significant transformation of the accepted narrative on nuclear weapons: nuclear disarmament is not a fringe idea but a majority consensus position that cannot be ignored. This was further demonstrated by Pope Francis’ declaration in November that nuclear weapons are ‘senseless, even from a tactical standpoint’ and that ‘their very possession is to be firmly condemned’. Compare this statement to Pope John Paul II’s argument that nuclear deterrence could be judged as ‘morally acceptable’ in the eyes of God, and it is clear that the global narrative is evolving. Yet the formally established nuclear powers of the world continue to argue that these weapons offer a ‘strategic peace’. The governments of the US, UK, France, Russia, and China claim that through the promise of mutually assured destruction, world war is no longer an option. These states (who also make up the permanent members of the UN Security Council) are not the only states with nuclear weapons, but they are the only states that are both signatories of the Non-Proliferation Treaty and who argue that nuclear weapons bring peace. The price of this ‘strategic peace’ is a total global expenditure of US$12 million per hour, or $105 billion every year . The reality of this nuclear-armed peace is a world not free from hostilities but locked in a perpetual state of war – from the Gulf War in 1991, Somalia in 1992, Bosnia in 1995, Iraq in 2003, Libya in 2011, to the still-ongoing 2001 War in Afghanistan, the ‘strategic peace’ staggers onwards. Now a nuclear-armed North Korea demonstrates yet again that unless the major powers take meaningful steps towards disarmament, global insecurity will thrive. Once, the legitimacy of this ‘strategic peace’ and international nuclear orthodoxy appeared unchallengeable. But campaigners, backed by the Nobel Peace Prize committee, the 53 state signatories of the ban treaty, the Pope, the Catholic Church, and millions of anti-nuclear activists around the world now have an opportunity to challenge and delegitimize it. 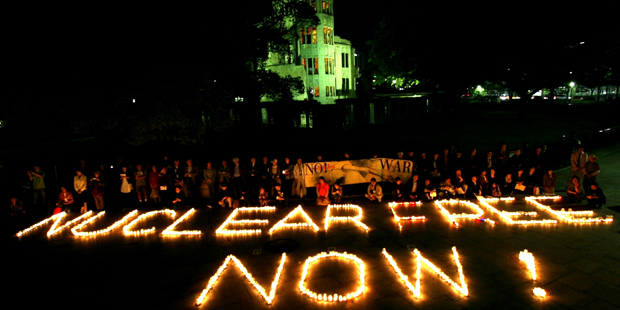 For the first time, the majority of the world is clearly united behind the cause of total nuclear disarmament. A new form of peace is not just imaginable but tangible; a peace based not on millions of civilian lives being held hostage by the threat of atomic evisceration, but on transnational collaboration, UN treaties, trade agreements and global disarmament. It is often very hard to see the light of progress through the shadow cast by inter-state conflict and the threat of nuclear war. It can often feel nearly impossible to imagine a world in which nuclear weapons no longer exist. But the progress made in 2017 has created cracks in what appeared to be an unbreakable orthodoxy. Our job now is to widen those cracks, and never lose faith in the strength of collective agency to bring about change. It may not happen in 2018, but global nuclear disarmament is in sight. 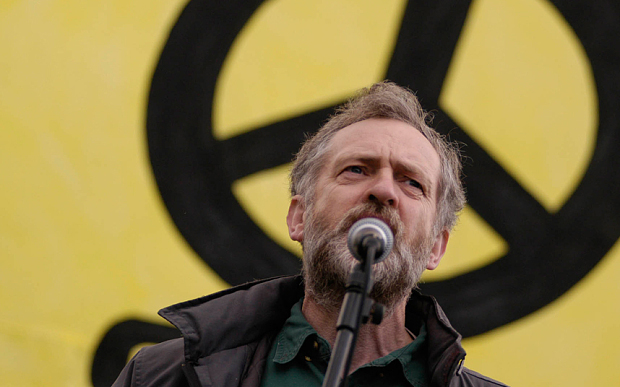 With a ‘lefty’ at the helm, why isn’t Labour supporting the peace movement? Jeremy Corbyn is a ‘lefty.’ Love him or loathe him, it is difficult to argue that the Islington North MP and Leader of the Opposition is a traditional politician. His shock election and the Labour Party’s subsequent shift to the left has led to electoral success and a rejuvenation of the Party. However, it has not led to a total rejuvenation in his party’s policy; Labour continue to support the wasting of £205 billion on Trident replacement. So why isn’t the peace movement, a cause very close to Corbyn’s heart, getting a look-in? How can we ensure that such an important cause receives the recognition it deserves? With Corbyn, an uneasy – but necessary – tension has arisen in the Labour Party. There was bound to be tensions when a man like Jeremy Corbyn became leader in a shock result. Having joined the Campaign for Nuclear Disarmament as a schoolboy in 1966, Corbyn became both Vice-Chair of the CND and Chair of the Stop the War Coalition during his time as a backbencher. Gaining a reputation for his activism, he became Labour’s most rebellious Member of Parliament from 1997 to 2010, defying the party whip a staggering 428 times. Meanwhile, the establishment Labour Party did not share his passion for peace. Former Shadow Cabinet Minister Tristram Hunt called the Stop the War Coalition “a really disreputable organisation,” whilst MP Caroline Flint said that the organisation were “not Labour’s friends.” With New Labour not wanting to rock the boat, the party decided to take the same side as their Conservative opponents and support the destruction of lives through support of the Iraq War and nuclear weapons. With such a difference in opinion fracturing the party, you would not be blamed for assuming that a massive overhaul would take place after Corbyn’s meteoric rise to power. Bogged down by internal conflicts and lacking support, Corbyn was unable to tackle such a huge problem. In their 2017 General Election manifesto, Labour supported the renewal of the Trident fleet, under the apparent constraints of the Nuclear Non-Proliferation Treaty. Appearing on Question Time in May, it was pretty clear that Jeremy Corbyn did not agree with establishment Labour’s belief in nuclear weapons. He said on the programme that he would never approve of ‘first use’ of Britain’s nuclear arsenal. To some, it seemed like the Leader of the Opposition had blown his chance to take his lifelong anti-war politics to the mainstream. However, the cause remains alive and kicking. 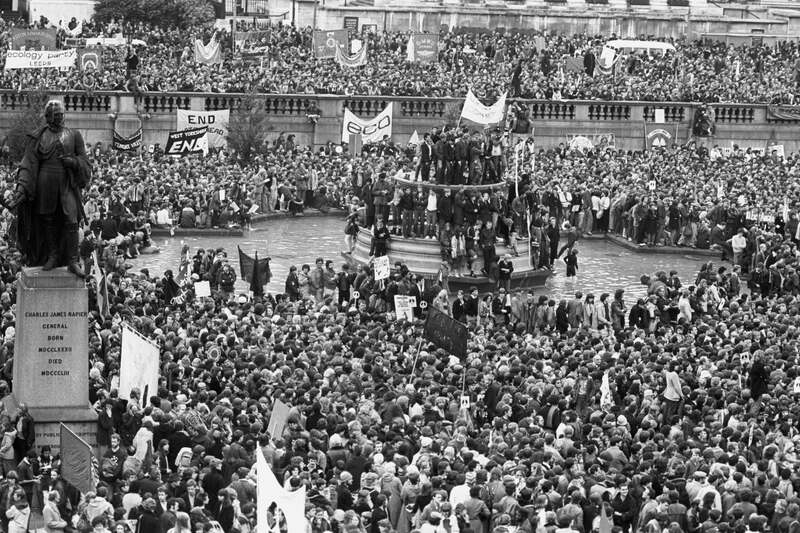 Rather than an issue of public opinion, the question of Labour’s support for the peace movement is one for Labour’s establishment. It is likely that the Labour Party have chosen to support Trident renewal on the basis of its perceived popularity rather than any sort of conviction. This appears ill-founded. In 2016, an ORB poll of UK adults found that 49% of those surveyed did not support the full renewal of Trident. In Scotland, where the fleets are actually located, opposition was at 64%. Being anti-nuclear weapons is hardly an unpopular opinion. So, how do we change Labour’s peace policies? Simply put, we could just wait. Support for nuclear weapons is lowest amongst young people. A 2014 poll by ComRes showed that just 19% of 18-35 year olds polled believed that Trident should be renewed at equal size and capacity. Hannah Cornford, of WMD Awareness, said of the poll: “it is clear that young potential voters are not being engaged by the government on this issue.” Last month, the Young Labour Conference passed a motion saying that the United Kingdom should leave NATO, an idea that is in direct contradiction with the party line. Young people dislike nuclear weapons and are not afraid to disagree with establishment opinion; this is a recipe for progress in the peace movement in the coming years. Another, less delayed possibility for progress comes from the Labour Party itself. The Party is currently undergoing a self-imposed Democracy Review. A leaked document, apparently concerning this review, shows that they are keen to strengthen the involvement and participation of members in constituencies. If this is true, Labour should be keen to involve their pro-peace members by allowing them to affect party policy. The party also wants to focus on the recruitment of more members. In order to strengthen support and attract members, the Party must listen to its supporters. The issue of nuclear weapons is pressing and potentially a matter of life and death; unlike these internal divisions in the Labour Party, it cannot be brushed aside. In 1945, two nuclear bombs named ‘Little Boy’ and ‘Fat Man’ were dropped on Japanese cities. Now, 72 years later, nuclear-armed Kim Jong-Un claims that Trump’s comments at the UN were ‘a declaration of war’. The volatile relationship between this modern ‘Fat Man’ and ‘Little Boy’ (I’ll let you decide who is who) continues to pick up pace, dragging the world towards yet another war. Before Trump got elected, lots of people said that one positive that could come from it might be that the US became less invested in major interventionist wars. 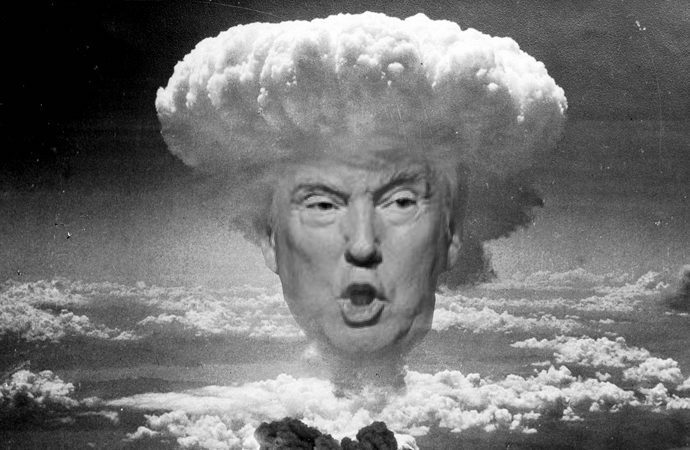 Unfortunately it’s turned out that Trump is simply more interested in a different kind of war – one with bigger bangs, and in his deranged mind, probably more applause. Instead of goading Kim to launch a strike towards the US, Trump should be engaging in diplomacy. He says he has ‘the best words’, but I’ve yet to see them being used for anything beyond inflating his own ego. However, it’s obviously far too simplistic to place all of the blame for the US-North Korea nuclear situation at Trump’s feet – indeed, it has much to do with the totalitarian dictatorship of the Kim family as well as the failure of historic US policies – yet Trump has done nothing but exacerbate it. Clearly his rhetoric is more about gaining domestic support by appearing to face down the scary foreign threat, but when you consider all of the facts, the threat from North Korea to the US is wildly unlikely and insignificant. In reality, the situation is that a small but aggressive rogue state appears to have successfully tested two single long-range missiles without explosives, and is using this as a bargaining chip to gain a seat at the table of the international community. Kim wants security, trade, money, and influence – not an irradiated peninsula. Instead of seeing this as a potential opportunity to test out the most devastating weapons humans have ever created, how about we take a minute to consider a few other aspects of the situation. First, a blank test of a long-range missile does not mean North Korea is now a threat to the United States. Imagine you’re a child and you’ve built a slingshot from sticks and rubber bands (I know it’s not the 1950s but bear with me for a second here) and you use it to shoot a rock across your garden. It works the first time, but you use it again and the stick starts to bend a bit from the strain of the rubber band being pulled back. The next time you use it, the stick bends just a little more. Finally you see your next-door neighbour and take aim at him with your trusty slingshot – when it snaps apart and a Hwasong-14 nuclear blast goes off in your hands. This is the situation facing North Korea: one successful long-range test is useful to scare the world, but in no way a sign that they are technologically ready for war. They are a deeply impoverished and isolated nation just struggling to develop anything close to the military technology that the US has. Second, let’s just think about North Korea’s perspective here: Kim Jong-Un is a madman, but he’s unlikely to be suicidal. As a young leader in the shadow of his late father, Kim is doing his best to prove his worth – and he seems to think the best way to do that is through a nuclear deterrent. Having put in years of effort to secure nuclear materials, he’s probably not going to fire them off at random – he did it because he wanted to secure his position, not see himself and his home be immediately eviscerated. Third, and finally, what happens if Trump decides that Kim has pushed it too far and we better ‘show him a lesson’? Considering Kim is desperate to be the bigger man, and has to demonstrate that to his people, what’s he likely to do if he’s attacked? In this sense, Trump’s sensitive ego and hair-trigger buffoonery look like the most likely thing to push Kim into attacking South Korea or Japan, leading to a global war and an enormous refugee crisis. My point is not that North Korea should have nuclear weapons – far from it, I think every nuke on earth should be launched into the sun and forgotten about forever. Instead, my point is merely that right now Trump’s fragile ego is what stands in the way of a global catastrophe, and that leaves me feeling extremely uncomfortable. If this worries you just as much, you should come along to our event on the 21st October to learn how to challenge the narrative that nuclear weapons provide international security. It’s from 10am – 4pm at the Waterloo Action Centre, it’s free, and there will be some food and beer! 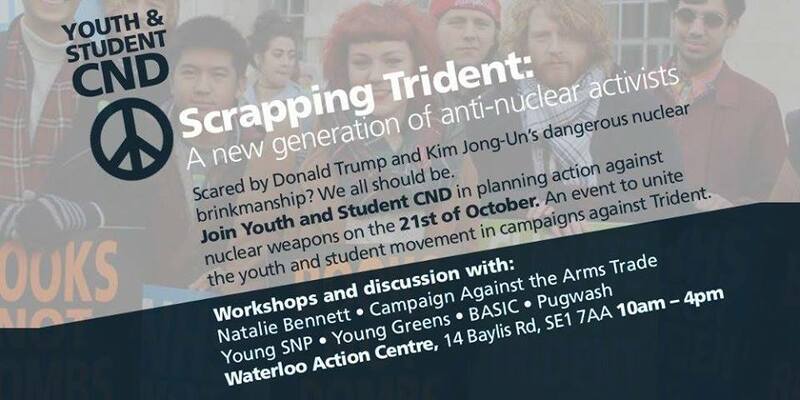 We’ve organised it to try to give students and young people the right activist and direct action skills needed to challenge the f**ked up society that tells us we need genocidal weapons to stay safe. It’s been a busy couple of weeks for CND. Unsurprisingly, when the President of the US threatens nuclear war, the Campaign for Nuclear Disarmament has something to say. 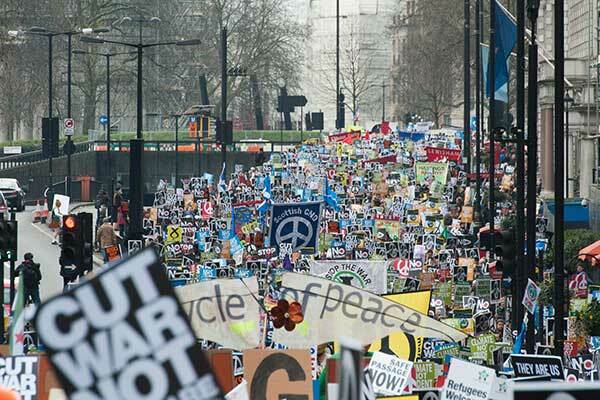 Resisting the urge to lock up the office, buy supplies, and start to dig bunkers, instead CND have been organising letters and protests to challenge this dangerous rhetoric. However, the Prime Minister of the United Kingdom seems to have chosen the former option. After a long stint in the Alps (far away from any nuclear fallout) Theresa May has supposedly returned from her holiday, but she seems to have now chosen to hide underground and hope no one comes looking for her. There is still a deafening silence coming from Number 10 on the growing tensions between the US and North Korea. This is the closest we’ve been to nuclear war in my lifetime. I don’t remember the constant state of crisis of the Cold War, I’ve only ever had to imagine it. But the last few weeks feel to me like the re-emergence of what I’d pictured – a permanent state of urgency which is exhausting. A sense that nuclear war is 5 minutes away, it’s just no one knows when to start counting from. We could easily get used to this permanent state of terror, and become accustomed to our Prime Ministers silence. Instead, we must refuse to go away; she has to face up to her responsibility to protect her citizens. Silence from the UK is not a neutral position either, it is a tacit support for both the US and North Korea’s ongoing sabre rattling. There is, of course, an element of hypocrisy to a leader calling for calm when they themselves have said they’d be willing to push the nuclear button. Consensus used to be that Britain would not accept a Prime Minister who was anti-nuclear weapons. However, Jeremy Corbyn’s rising approval ratings shows that being willing to kill thousands of innocent civilians via nuclear attack is not a prerequisite for political popularity. That’s why the first step of Theresa May should be to re-engage with the UN’s Global Nuclear Ban Treaty, which would be a commitment to scrap Trident, taking the lead among nuclear powers in the process of disarmament. The treaty opens for signatures on the 20th of September and support from the UK would signal that this country is not willing to participate in a nuclear war. The events of the last weeks should be a wakeup call; now is the time for the government to reverse its decision to ignore the talks and the treaty. If what drives her is power, and the need for political influence, then there would be no better way to make a real global impact. What is necessary in this situation is for one leader of a nuclear state to have the bravery to take the lead in disarmament. If May were to do so, there’s no doubt it would make the world a safer place. Since Theresa seems unsure as to how to stand up to the US and North Korea, CND have written her a letter with some advice. The letter reminds her of the Ban Treaty, and gives two other demands. Firstly, she must rule out sending British armed forces to the Korean Peninsula. The UK sent four Typhoon fighter jets to take part in military exercises in the East and South China seas last year, jointly with Japan, a gesture which only aggravated tensions there. To do the same during this crisis would be an act of provocation. If May cares about the safety of Korean civilians, from both North and South, she could instead back South Korean leader Moon Jae-In’s calls for negotiation. While Trump and Kim Jong-Un have been threatening each other, and Theresa May has been hiding in her nuclear bunker, he has promised to send a special envoy to North Korea for talks if they stops their missile and nuclear testing. 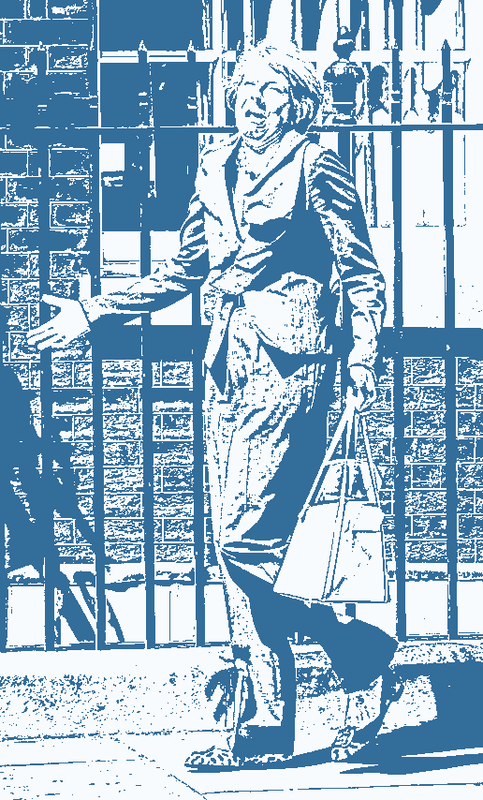 Indeed, CND’s third demand is that the UK support efforts to resume Six Party Talks. This would mean diplomatic talks with South Korea, North Korea, the US, China, Japan and Russia, as Jae-In has asked for. It should be a no brainer that Theresa May stands with him. These demands cannot just come from CND, but must come from us all. It is the first duty of a Prime Minister to protect her citizens, and yet she is sitting back while the world is in a state of emergency. Sign our letter to tell Theresa May her that you’ve noticed her silence, and won’t be letting her sleepwalk the country into nuclear war.